via Index – Tech – A rendőrök is tőlünk töltik le a filmeket. Piracy is so difficult to battle because file-sharers are motivated by altruism and not financial gain, according to one academic. Joe Cox, an economist at the Portsmouth Business School, believes file-sharers who post content online see themselves as the “Robin Hoods of the digital age,” according to a study he’s published in the journal Information Economics and Policy. Such insight could help drive policy and find ways to prevent illegal downloads, he claims. We spoke to him to find out more. Q. Why did you decide to look at file-sharing? A. A lot of the academic effort which has focused on file-sharing has been on lost revenues, to say how much the record industry and the film industry has lost as a result of people illegally downloading content. I was more interested in the behavioural motivations. To me it seems pretty obvious why you might want to illegally download a music track or a film or a video game, but what I was really interested in is the people who make the content available in the first place, because there doesn’t seem to be much to be gained for them, at least not materially. They presumably already bought the material to make it available in the first place. I called them seeders – it’s a pretty standard term for people who make the material available – distinguishing them from leechers, who just take material from others but don’t give any back. I’ve never seen anything published which looks at those two groups to look at their different motivations. Q. What was the motivation for seeders? A. For the leechers, pretty obviously, the major motivation was financial. They wanted to acquire music or films without paying for it because it was cheaper than going out to buy it. What was interesting was the difference with the seeders, and it was quite apparent that financial motivations were nowhere near as prevelant; it was a kind of altruism. Their main motivation was that they were seeking notoriety, peer recognition, peer esteem, some sort of feeling of getting one over on the system. It was a much richer tapestry of different things contributing to the decision to go ahead and make the content available. Q. With that in mind, how should illegal sharing be prevented? A. The survey data suggested there was a deep-seated belief that this type of activity shouldn’t be illegal, that there was no criminal act involved. That makes it very hard to deter with advertising to suggest that you’re funding piracy, that you’re a cheap knock-off merchant, because they believe what they’re doing is morally right. And it’s these guys that record labels and movie studios are most interested in getting to. They’re the source. Q. You’ve said the Digital Economy Act won’t work, so what do you suggest? A. Technology has developed to such a point now that you can’t turn back the clock and you can’t change the digital revolution – it’s a bit like King Canute trying to halt the advance of the tides. I think there needs to be a more radical rethink in how the arts and the creative industries are funded. The phenomena of the record label and the movie studio pretty much come into their own in the 20th century and I think they are a 20th century phenomena. Before that opera, ballet, and music were funded on a system of patronage. I think we need to consider potential funding from the public sector. Coming at this from an economics perspective – I’m an economist – we have a particular type of common good that we look at, called a public good. The characteristics of this are you can’t exclude people from enjoying the benefits of it if they don’t pay for it, and if any one person consumes the good it doesn’t affect anyone else’s ability to consume it too. Classic examples are things like street lighting or national defence. I would argue that these days music and movies are public goods. You can’t really exclude people from using them. The internet is giving them the availability to share this material at will and it’s virtually impossible to stop that. And with the digital nature of material, you can make perfect reproductions and share it to others. What economists say will happen if you have a public good and look to the free market, the market won’t provide any output because everyone will just look to free-ride, and not pay themselves. But if no-one pays the good doesn’t get produced. Q. And public funding is the way to get around that? A. With street lighting or national defence, these are things that government funds through taxation. It would probably be a bit radical to say the government should fund the creative industries through taxation, but there are creative ways knocking around at the moment. For example, you could try introducing non-commercial use levies on iPods or DVD players. It’s a lump sum you would pay over and above the purchase price when you buy the device, with the understand that you’re going to use it to access digital content. If that money was collected into a pot, it could be distributed to record labels and movie studios to give proper compensation to rights owners. And then there could be a relaxation on how people access the material. You could keep track of downloads to make sure the most popular artists get the most money. Operation Payback has been without a doubt the longest and most widespread attack on anti-piracy groups, lawyers and lobbyists. Despite the massive media coverage, little is known about the key players who coordinate the operation and DDoS attacks. A relatively small group of people, they are seemingly fuelled by anger, frustration and a strong desire to have their voices heard. In the last two months, dozens of anti-piracy groups, copyright lawyers and pro-copyright outfits have been targeted by a group of Anonymous Internet ‘vigilantes’ under the flag of Operation Payback. Initially DDoS assaults were started against the MPAA, RIAA and anti-piracy company AiPlex Software because these outfits had targeted The Pirate Bay. Those DDoS attacks were later replicated against many other targets that have spoken out against piracy or for copyright, resulting in widespread media coverage. Even law enforcement agencies showed interest in the operation recently. Last week CNET reported that an FBI probe is underway, and TorrentFreak personally knows of at least one court case against a person that was associated with the operation. Besides covering the results of the DDoS attacks and website hacks, very little is known about the people who are part of the operation. Who are they? What do they want, and what are their future plans? In this article we hope to solve a few pieces of the puzzle. After numerous talks with people who are actively involved in Operation Payback, we learned that there are huge differences between the personal beliefs of members. We can safely conclude that this Anonymous group doesn’t have a broad shared set of ideals. Instead, it is bound together by anger, frustration and the desire to be heard. Their actions are a direct response to the anti-piracy efforts of pro-copyright groups. Aside from shared frustration, the people affiliated with the operation have something else in common. They are nearly all self-described geeks, avid file-sharers and many also have programming skills. When Operation Payback started most players were not looking to participate in the copyright debate in a constructive way, they simply wanted to pay back the outfits that dared to target something they loved: file-sharing. Many of the first participants who set the DDoS actions in motion either came from or were recruited on the message board 4Chan. But as the operation developed the 4Chan connection slowly disappeared. What’s left today are around a dozen members who are actively involved in planning the operation’s future, and several dozen more who help to execute the DDoS attacks. An Anonymous spokesperson, from whose hand most of the manifestos originated, described the structure of the different groups to us. Occasionally new people are invited to join the command to coordinate a specific attack, but a small group of people remains. The command group is also the place where new targets are picked, where future plans are discussed, and where manifestos are drafted. This self-appointed group makes most of the decisions, but often acts upon suggestions from bypassers in the main IRC channel. Now let’s rewind a little and go back to the first attacks that started off the operation in September. The operation’s command was ‘pleasantly’ surprised by the overwhelming media coverage and attention, but wondered where to go from there. They became the center of attention but really had no plan going forward. Eventually they decided to continue down the road that brought them there in the first place – more DDoS attacks. 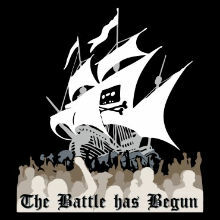 What started as a retaliation against groups that wanted to take out The Pirate Bay slowly transformed into an attack against anyone involved in anti-piracy efforts. From trade groups, to lawyers, to dissenting artists. Since not all members were actively following the copyright debate, command often acted on suggestions from the public in the main IRC channel. What followed was an avalanche of DDoS attacks that were picked up by several media outlets. This motivated the group to continue their strategy. Anonymous’ spokesperson admitted to TorrentFreak that the media attention was indeed part of what fuelled the operation to go forward. But not without some strategic mistakes. As the operation continued more trivial targets were introduced and the group started to lose sympathy from parts of the public. While targeting the company that admittedly DDoSed The Pirate Bay could be seen as payback by some, trying to take out Government bodies such as the United States Copyright Office and UK’s Intellectual Property Office made less sense. In part, these targets were chosen by anarchistic influences in the operation. The Anonymous spokesperson admitted to TorrentFreak that mistakes were made, and command also realized that something had to change. The targets were running out and the attacks weren’t gaining as much attention as they did in the beginning. It was a great way to gather attention, but not sustainable. In fact, even from within the operation not everyone was convinced that DDoS attacks were the best ‘solution’. “I personally don’t like the concept of violence and attacking, but violence itself does raise attention,” Anonymous’ spokesperson told TorrentFreak. Last week command decided to slow the DDoS attacks down and choose another strategy, mainly to regain the focus of attention. It was decided that they would make a list of demands for governments worldwide. In a move opposed to the desires of the anarchic influences, command decided to get involved in the political discussion. Copyright/patent laws have to change, they argued, and from the bat they were willing to negotiate. They called for scrapping censorship, anti-piracy lawsuits and limiting copyright and patent terms, but not getting rid of copyright entirely. Interestingly, there is also no word in the demands about legalizing file-sharing. To some this new and more gentle position taken by Anonymous came as a complete surprise. We asked the spokesman of the group about this confusing message and he said that there are actually several political parties that already adopt a similar position, like the Pirate parties and the Greens in Europe. “What we are now trying to do, is to straighten out ideals, and trying to make them both heard and accepted. Nobody would listen to us if we said piracy should be legal, but when we ask for copyright lifespan to be reduced to ‘fair’ lengths, that would sound a lot more reasonable,” the spokesman told TorrentFreak. The demands have been published on the Operation Payback site for nearly a week, but thus far the media coverage hasn’t been as great as when they launched their first DDoS. Some have wondered whether this is the right path to continue in the first place, as it may get in the way of groups and political parties that have fought for similar ‘ideals’ for years already. The spokesman disagreed and said that Operation Payback has “momentum” now. So here we are nearly two months after Anonymous started Operation Payback. The initial anger and frustration seems to have been replaced by a more friendly form of activism for the time being. The group wanted to have their voice heard and they succeeded in that. However, being listened to by politicians and entertainment industry bosses might take more than that. Kezdjük a legérdekesebbel, úgy tűnik a BitBarát és a DeathLord szervereit egy kósza Ákos cd (illetve nyilván az ahhoz passzoló torrent file) miatt lefoglalták. Nem elérhető ezenkívül a BigTorrent és Z-Tracker sem, de ezeknek az oldalaknak az elvitelét senki nem erősítette meg ezidáig. A Majomparadé gyorsan reagált a lefoglalásokra, tegnap óta “meghatározatlan” ideig tilos feltölteni az oldalra magyar zenét. Hasonlóképpen döntött ma a Carpathians is. Oda a mai naptól fogva “TILOS” feltölteni Ákos anyagait tartalmazó torrenteket. A 1st a nemzeti ünnep miatt freeleechet tart. Szerver problémák miatt áll az Evo is. Legközelebb elindulás csak a jövő hét elejére, hétfő kedd környékére várható. Az Insane készített egy “Tetszik” gombot a torrentoldal adatlapjára. Minél több embernek tetszik egy torrent annál jobb lehetőségeket biztosít a tracker. Amennyiben egy torrent eléri a 200 tetszést, úgy automatikusan dupla lesz (ha még nem volt az). 300-nál 3x-os feltöltés, 400-nál 4x-es, 500-nál 4x-es és ingyenesen letölthető lesz automatikusan. A TvStore oldalára ezidáig mintegy 10 ezer felhasználó regisztrált be. Ez, ha emlékeink jók, a BitGate állományának a fele. Az oldalon jelenleg majdnem 5000 aktív torrent van, több mint 30 ezer kapcsolódással. Megjelent a https-es belépés lehetősége és a Wiki az nTrace oldalán. Ezenkívül törölték az inaktív felhasználókat, maradt kicsivel több mint 12 ezer tag.